With school right around the corner and despite this being one of the best summers of my life, I definitely need to find a way to keep this momentum of awesomeness going. Thomas Edison’s famous quote “Genius is 1% inspiration, 99% perspiration”, is more than just a cliché. Because we at GLB love lists, here are five ways to stay focused and disciplined, even when inspiration seems to be fading. Luckily, I love being organized and having routines so this isn’t too difficult. Making sure to pencil in time for meditation or self-reflection, fun, and brainstorming sessions (i.e, ways to achieve your goals, 30 things to do before 30, etc.) is vital. Target has some super cute planners at fantastically affordable prices for back to school! I really like the 5X7” FEED for Target planner because it’ll keep me up to date while conspicuously displaying the number of meals I’ve provided to under-served children and families across America (12 – and I’m not knocking it, the idea is great)! Even though people are definitely split on where telling others their deepest desires, hopes and dreams is a smart thing to do, I think that having ONE person who knows your goals can be a great way to stay disciplined. That person can keep you on track if you get derailed or into a funk, and obviously he/she (or anything in between since gender doesn’t exist :P) would be someone you trust. Meaning don’t choose a frenemy as your accountabili-buddy, unless you want Gossip Girl drama. Having a mentor is another great way to stay motivated to work hard because you’ll have a relationship with someone you admire. 3. Create/have a vision board. Maika created one that she works on from time to time and having a visible representation of everything you’re striving for can be a way to stay motivated. Make sure to keep your dream map in a location where you’ll see it frequently, like next to a mirror or the television remote if you’re so inclined. By having that reminder of what you want in the long term, completing the tasks to get there in the short term should seem less daunting. 4. Create an inspiration playlist of songs that get you excited about anything. Whether it’s for working out, studying or anything in between, music can affect how you’ll maintain a positive and strong work ethic. Also, don’t think that you have to stick to anything sung by Whitney Houston (R.I.P) to truly feel “inspired”. Two of my favorite inspo songs are by Childish Gambino (The Last and F*ck it All) and don’t give listeners the traditional “feel good” feelings associated with anything on the soundtrack of The Prince of Egypt, for instance (which is also my jam!). 5. Get (and stay) involved! 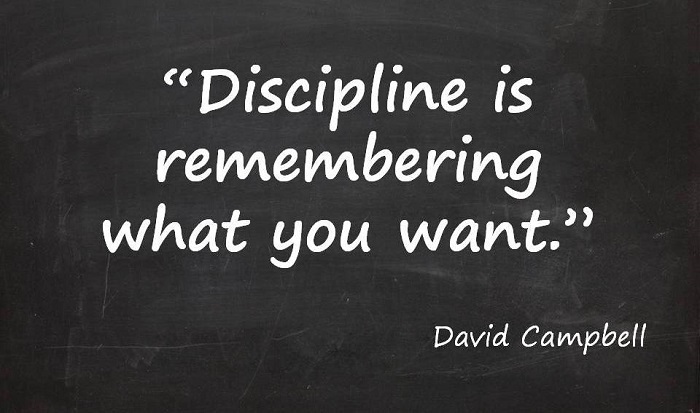 Are there any helpful tips you have to keep yourself disciplined and motivated? Write them down in the comments and let me know how they work for you! Jessica is a writer at Daily Ellement. She writes about Culture and Conversations.